Example, solutions, videos, and songs to help Grade 4 students learn about Improper Fractions. An improper fraction is a fraction whose numerator is greater than the denominator. The fraction a/b is an improper fraction if a > b. 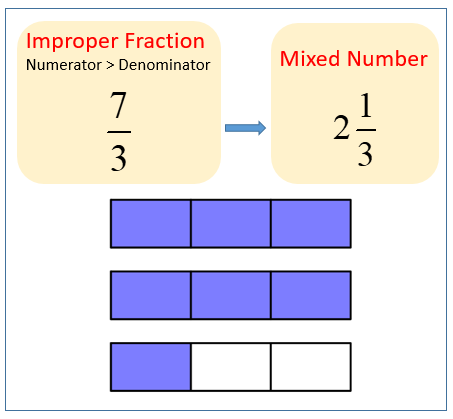 We can convert an improper fraction to a mixed number by dividing the numerator by the denominator. The following diagram shows an example of improper fraction. Scroll down the page for more examples and solutions on how to convert between improper fraction and mixed number. How to convert between improper fraction and mixed number?